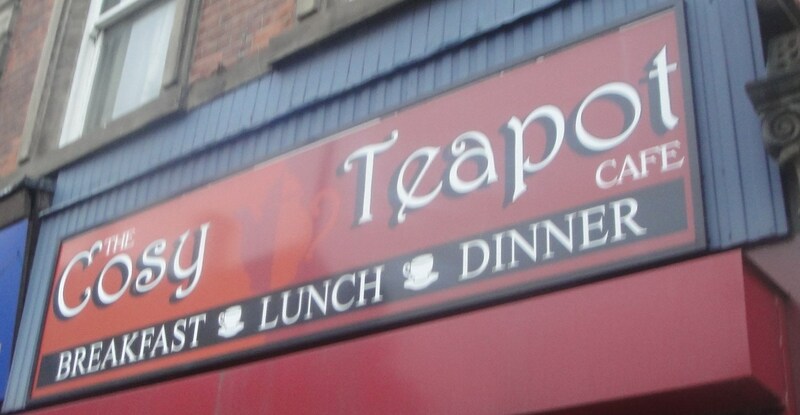 Back in 2003 The Cosy Teapot café on Carrington Street in Nottingham won the title of “Britain’s Greatest Greasy Spoon”. I did eat a breakfast in there back around that time and it was pretty good. For a while there was a sign in the window telling all who passed of their award success, as I walked past on Friday I noticed that sign was no more, but then again it is 10 years ago. I wondered what it was like now and figured that the only way to find out was to take the time to pass across their threshold and partake of a cooked English breakfast. The first thing to note was that it was certainly still very popular, filled with orange vested workmen from the nearby tram construction sites. That should be a good sign (but then again) lets see what comes out from the kitchen before we get too excited. As greasy spoon breakfasts go I have had worse, but it was a very different story from the last time I ate here. The sausage was one of those economy sad almost soggy bread filled efforts, the ‘hash’ brown was more soggy than crispy and appeared to be straight from a packet. The beans were runny with more juice than beans. On the plus side the bacon was OK (if you like cheap bacon) and the egg yolk was still runny. 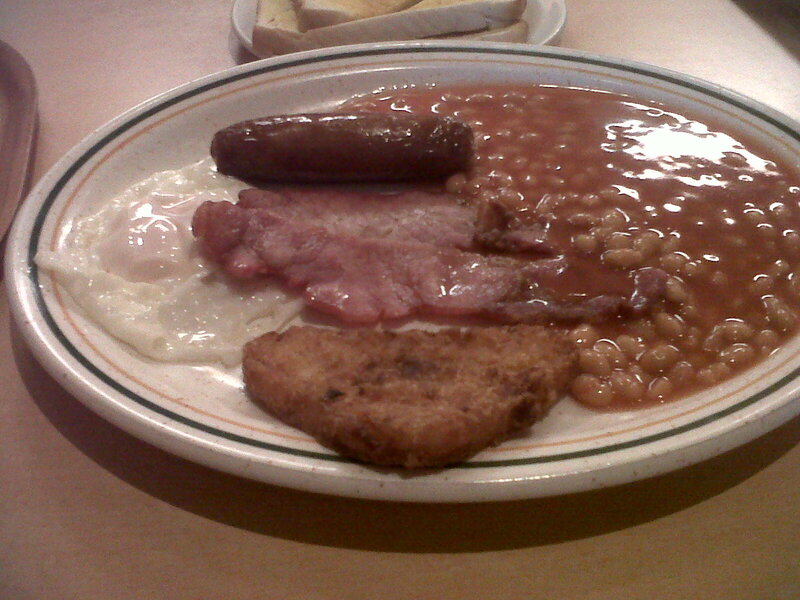 It came with two slices of butter laden toast made from cheap white bread which was OK for mopping up the bean juice. I said that the quality was not as good as ten years ago, but thinking about it 10 years ago I did not really know of a better sausage, or of really good bacon from the farm shop, there were very few happy chickens providing me with eggs and I was known to buy tins of baked beans (or bean soup) from Netto for 4p a can. So perhaps times have changed, my palate and expectations have expanded, and yes I admit it I can be a bit of a snob when it comes to my breakfasts. I cant see it winning many awards these days but the service was good, quick, friendly and efficient so it was not a bad experience overall, even if the food didn’t tick any boxes. Perhaps you should use the golden rule of looking through the window to see if it is busy and judge that as a good indication of whether it is any good or not. That does not always work but as a general rule it rarely fails. I am not personally likely to add this to my breakfast rotation list but that is just me, it is a local place run by local people so on that basis it is worth supporting and if you are passing by and need a cheap and cheerful breakfast, well that is what you will find at the Cosy Teapot.